I'm excited to share with you today the work of my friend, Ryan Feerer. We met in New York City, where he worked as a graphic designer and illustrator for the same digital firm as my husband. Cut to several years later, we've all moved out of New York, and Ryan has expanded his career to include interiors. His first major project: Abi-Haus, his own restaurant, in his hometown of Abilene, Texas. We spoke recently to discuss how this opportunity developed, his process and inspirations, and how designing for spaces differs from doing work in 2-D.
Tell me how Abi-Haus came to be. What was your role in it? On Halloween of 2010, Jimbo Jackson and his family stopped by to trick-or-treat at my house. They are a young family and had just moved into the neighborhood. We immediately became friends. We share a love good food and missed our experience in our previous homes, Pittsburgh and New York City, respectively. Jimbo and I would often cook our favorite dishes at each other's houses, and eventually started playing around with the idea of opening our own place. When Jimbo had an opportunity to get out of the Air Force, he asked me if I'd be interested in opening up a place downtown. Thinking nothing anything would come of it, I said yes. 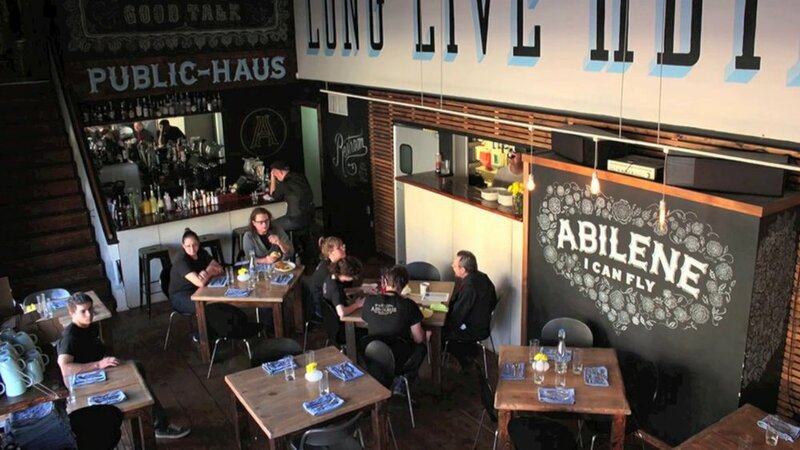 Four months later, Abi-Haus opened. Abi after the Abilene, Texas airport code, and Haus comes from his son's name (Hauston) and the German word for house, of course. Jimbo is co-owner and primary manager. I am the other owner, but only fill in a few times a month. How did you come up with the design aesthetic for the restaurant? It strikes me as something that would be at home in Brooklyn. Is it unusual for Abilene? Is that an advantage for your business? We wanted the building/interiors to seem raw and natural. The restaurant is in one of the oldest buildings in Abilene, and we wanted to take advantage of its original aesthetic. My friends, Dana Tanamachi and Jeff Rogers, came down from New York City, and we all teamed up on the interior design. Pretty much every wall is filled with carefully crafted typography. It's absolutely beautiful. It goes so well with my branding. All of that is to say: we wanted it to stand out from all of the BBQ and TexMex food joints in town, and it definitely does. Before we opened the restaurant, if you wanted the types of food we serve there, you would have to travel to Austin or Dallas, which are both about 3 1/2 hours away. Now Abilene has a little piece of the big city (NYC, Austin, Dallas, etc.) to "escape" to for a while. It really is like being transported to a little Brooklyn eatery when you walk up to the building. Abi-Haus stands out and is very much appreciated within our community. Does the food tie into the design? The design is very hip. Would you say that the food is the same? I feel like everything from the food, drink, music and the design of the place is so cohesive with the Abi-Haus experience. We hit our customers on all senses. It's super exciting for a creative to see. I guess you could call the food and drink hip. For lunch you can come in and get a wonderful Texas craft brew with some Korean fish tacos, or come in for dinner and get a smoked lamb shank and a Sazerac. We also have brunch on the weekends, which was relatively unheard of here before we opened. We've definitely brought some different culture into Abilene. How did you execute the design? Did you do the lettering yourself? I did all of the branding (logo, menu, icons, etc.) myself, and customized most of the type. 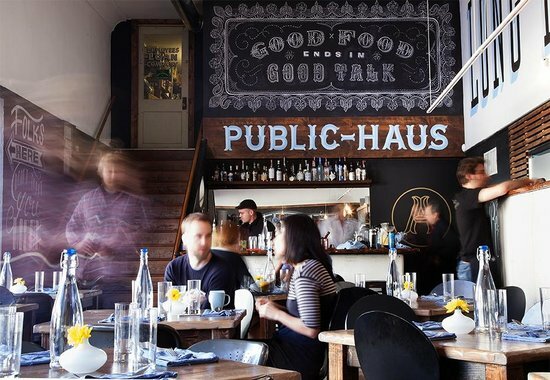 The Abi-Haus type within the logo and the Public-Haus type above the bar is all custom. I did about six or so logo options and a ton of variations. Jimbo, Drew Garison (bar manager), and Kyle Clemmer (executive chef) all gave me their thoughts about the design. From the final work I showed them, it changed very little. As for the interiors, Dana Tanamachi, Jeff Rogers, and I didn't have any plan-of-action. We met up at the restaurant, did some sketches, and started the next day. It was a five day process. Tell me a bit about the materials you used on the exterior and interior. For the exterior we only used black outdoor enamel paint. For the interiors we used that same paint, white chalk-paint, and chalk. Tell me about your background. Have you ever designed a space before? Jimbo's wife, Jessica, owns a women's boutique next to Abi-Haus. I helped with some of that space, but mainly through branding, signage, and murals. I'd never done anything this extensive. What did you like best and least about the project? I love everything about it. The chalk board menu can get a little muddy at times, but I knew that would eventually happen. What surprised you about it? How was it different from designing for print or web? Growing up I would always create things by hand. Whether it be drawing, sculpting, or whatever else, I felt like I was always creating. I’m usually quite confident in my work. My biggest obstacle was trusting my hand while painting the interiors. Jeff and Dana do a lot of that kind of work and it seems effortless to them. I, on the other hand, like to take my time, and time we did not have. Would you consider designing more spaces? Absolutely. I loved designing the overall experience. I'm actually going to be doing some interiors for a brewery opening up in town, and possibly for a new winery, as well. I'm excited about both! What’s on your bookshelf? How are you inspired? My bookshelves are made up of a TON of design books. I'm constantly adding to the collection. Aside from that, I find inspiration from various vintage finds and the work of other designers that I admire. A ton. Too many to name, but I'll try. Dana Tanamachi and Jeff Rogers for their beautiful craft. Scott Stowell and Randy J. Hunt for their design approach and overall knowledge. Brent Couchman for his simple and charming illustrations. Simon Walker, Curtis Jinkins, and Christian Helms for their overall awesomeness. I’m not planning on changing anything. Teaching design at Abilene Christian University has been a wonderful experience and I love my students. They keep my energized and on my toes. I have my own design practice and am fortunate to work with some amazing people and companies. I work at the restaurant about once a week. I am working on some children’s book concepts with my wife and friend. Hopefully that will take off. I stay busy and life is never boring.